Our stay at Casa El tulipan was so special! We felt so welcomed by Margas and Bernardos warm and open Personality. The room for 3 with our own entrance and a big patio with a Comfy hammock and Lots of shade was beautiful. Everything was clean and Marga was always there to answer all our questions. She Organised reservations in Restaurants, a Tour through topes de collantes and Transportation! We Highly Recommend a stay at El tulipan!! After a long trip from Holguin to Trinidad we received a warm welcome by Mara and Bernardo. We had our own floor with everything we needed. I must say I will miss the breakfast which was one of our best during our two weeks stay in Cuba. At the Case there was a guide with a lot of tips and hotspots. Thanks to Mara and Berardo we had a great day at the waterfalls with our own tourguide. The Casa is not far from the centre and has a lovely view from the balcony. Me and my friend both fell in love with the hammock! I would defenitely recommend this casa to other Trinidad travelers! How was your room? :	It was spacious and we had an airco. There was even a television with a dvd player. For the dutch people there were a lot of dutch books to choose from. How was the food they offer? :	The breakfast was excellent. Other services they offer:	You were able to book excursions like the waterfalls and horse riding through them. Mara and Bernardo make this casa an ideal place to stay in Trinidad. It's close to the Plaza and Restaurants, humble but clean, with a lovely terrace, kitchenette - everything you need. But the real gem are the hosts - Mara and Bernardo are so warm, welcoming, and helpful, they were the highlight of our trip to Cuba. How was the food they offer? :	Lovely breakfast on the terrace! Other services they offer:	Cuba is a country of contacts, phone calls, and local knowledge, and Mara and Bernardo are exceptionally generous in helping make your stay in Cuba a rich experience. 10/10 - we travelled all over Cuba for a few weeks, and this casa was the highlight of our trip. Yes the facilities, the terrace, and the location is incredible but what really gives this place its charm is Marga and Bernado. Their love for each other and Cuba is infectious, and they really made us feel welcome in their home. We are determined to go back! Beautiful people, beautiful home. How was your room? 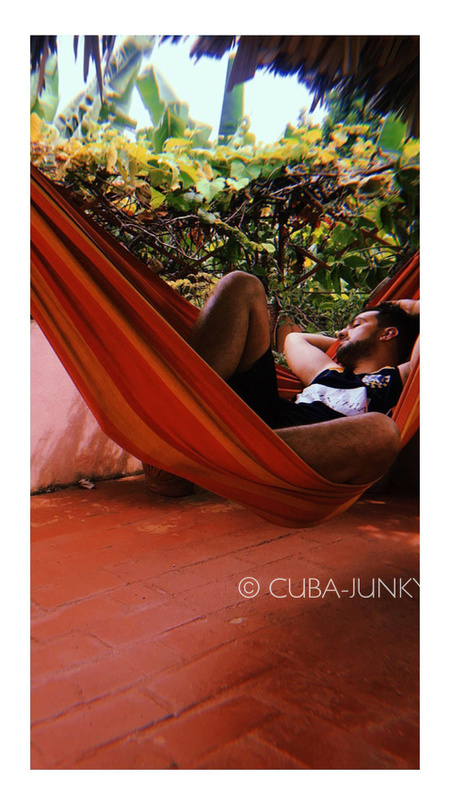 :	Room was exceptional when considering typical Cuban casas - the space is large; a sizeable double bed, kitchenette, lounge with sofa bed and TV / books / DVDs, ensuite and who could forget the roof terrace. 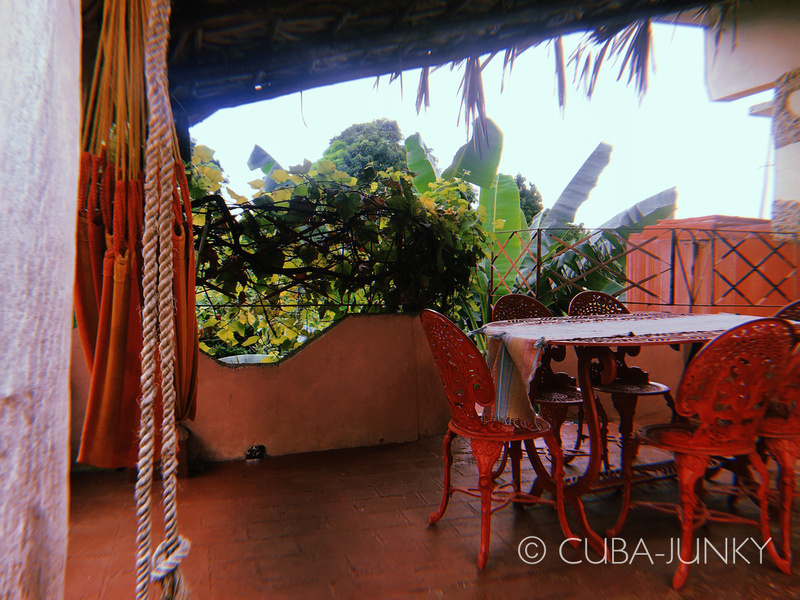 Surrounded by banana trees, this roof top over a busy Trindadian street is complete with hammock and rocking chairs - perfect for puffing on a Cohiba or sipping a cold Bucanero. Beautiful. How was the food they offer? :	Marga and Bernardo offer a great Cuban breakfast that will keep you full until the early afternoon. For just 5 CUC per person per day, we woke up every morning to a feast of fresh fruit, eggs, meats, bread, cake and coffee which we enjoyed on the lovely El Tulipan balcony before exploring Trinidad. Other services they offer:	Mara presented us with a book of amenities and services which Bernardo and herself offered - this included trips to El Nicho, the mountains, Playa Ancon etc... We decided to go to the beach on one of our days, and Mara recommended a beautiful, more romantic alternative to Ancon which was just stunning - we took the casa jeep there and had a fantastic time. When leaving, Mara also booked us a Bicitaxi at a moments notice to get us to the Viazul stop, no trouble at all. At the end of July I stayed for 3 nights @ casa El Tulipan. The casa is owned by Mara & Bernardo, 2 of the warmest and most welcoming people I’ve met during my stay in Cuba. They rent the second floor which consists of a living room, bedroom and a spacious patio on which they serve breakfast every morning. They can arrange lots of different activities and are more than happy to recommend good restaurants and places you can go out in the old town. The three nights I stayed over there really flew by. Thanks again for making my stay in Trinidad a succes! How was your room? :	Great. One floor is yours and consist of one bedroom, one living room and a spacious patio. How was the food they offer? :	They offer breakfast, served on the patio. For me the food was more than I could eat. Fresh fruits, bread, eggs, marmalade, yoghurt, cake, coffee, tea fruit juice etc. Other services they offer:	Organizing activities around the area. During our trip trough Cuba we stayed at el Tullipan for 3 nights. The welcome, personal attention and facilities in general couldn't have been better (a two room apartment and roofterrace are quite special in Cuba!!). Thank you so much for this amazing time in your great city. We definitely recommended!! This Casa couldn't have been more perfect. A perfect location - NOT in the heart of the tourist district, so you feel like you're really in Trinidad, and instead it is a quick walk to access tourism. Bernardo and Mara are amazing people, and amazing hosts - we couldn't have felt more welcome. How was your room? : Perfect - the room is a full, and the couch is a twin-size day bed. How was the food they offer? : Delicious breakfast - a perfect start to the day on the balcony. Other services they offer: They helped us find taxis to and from Habana, as well as around town. Other comments:	Friendly, wonderful people. We were instantly family. When we first stopped by, they had friends over, and during our trip we visited with those friends. It was like being welcomed home. I cannot wait to visit them again. We had the most amazing stay at Casa El Tulipan with Mara & Bernardo. Such amazing hosts, always smiling and helpful. Apartment upstairs was our favourite stay while in Cuba. Lots of room, private bathroom and even has a fridge to keep your drinks cool. Beautiful upstairs area just to ourselves where we could lounge in a hammock & listen to the sounds of Trinidad. Great location in Trinidad, only 5 minute walk into old quarter. Offered a great breakfast on the balcony & advise on local restaurants, things to do etc. Would highly recommend this casa. How was your room? : Spacious with air-conditioning & fans. How was the food they offer? :	Amazing breakfasts. They only do breakfast but give lots of great advice on local places to eat. There are amenities to cook in apartment of you wanted to. We had the best time at Casa El Tulipan! Mara and Bernardo were so welcoming and friendly. They gave us loads of great recommendations for places to eat and things to do. They also made us a delicious breakfast every morning (even when we arrived really early in the morning) - it was the best breakfast we had in Cuba. Thanks for such a great stay! How was your room? : Lovely! In the middle of the nice, authentic centre of Trinidad, you will find this extremely comfortable cosy house. It was the only accommodation in Cuba where we, sometimes, prefered staying home over going outside to explore. On the beautiful rooftop terrace, you'll find two rocking chairs and a hammock, and a nice breakfast (5 CUC) is served here every morning. Mara and Bernardo are two wonderful people who will always approach you with a smile, always ready for a nice chat. According to us this was the most pleasant stay in Cuba. How was your room? :	Excellent, clean and well equipped. Amazing terrace. Other services they offer:	They help you with all kinds of things - local recommendations, making reservations etc Other comments:	Thank you Marga and Bernardo for making our stay so beautiful!